10 festive designs of wrapping paper add up to selection, convenience, and fun! What Will You See at the Bottom of the Ocean? Durable plastic pieces maintain perfect spherical form! Many great subjects to choose from! Size (inches): 8.46" X 8.46" X 2.56"
The mysterious life that lurks in the depths of the deep ocean are clearly and colourfully revealed in this spectacular underwater scene. From starfish to sharks, this image has an incredible array of sea creatures, corals and plants. Say goodbye to flat, boring two dimensional puzzles and welcome a new challenge in puzzling - a 3-D challenge! 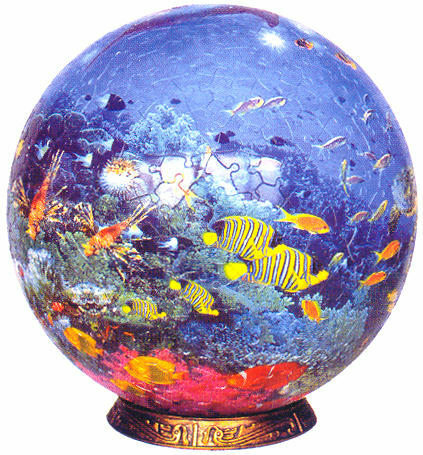 Puzzle Spheres are three dimensional puzzles that are unlike other three dimensional puzzles; these unique spherical puzzles are made from plastic to ensure durability in their completed spherical form. Also, no glue is required to hold the pieces together! There is an excellent numbering system on the back of each piece to help you out should you get stuck along the way!